Intermediate Algebra by Donna Gaudet, et al. by Donna Gaudet, et al. 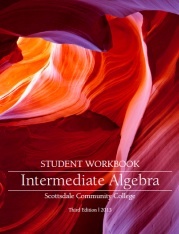 Intermediate Algebra consists of 12 lessons. Each lesson includes a MiniLesson (topic coverage via video examples and You Try problems for students), Practice Problems, and an end-of-lesson Assessment. The workbook can be used as a stand-alone resource or in conjunction with an online homework/assessment system called MathAS, also an open source system.